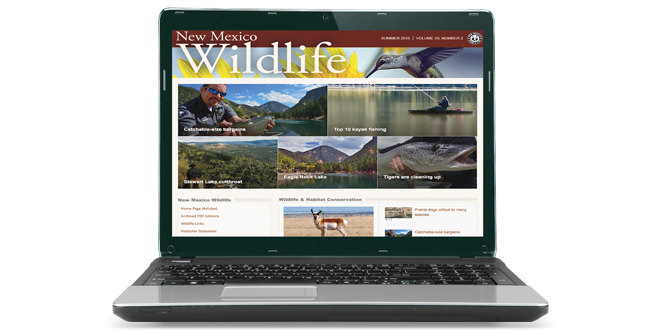 After years of being available as downloadable PDF editions, the New Mexico Department of Game and Fish now has a dedicated, interactive website for its New Mexico Wildlife magazine publication. The magazine, available in print since January 1961, now can be viewed at magazine.wildlife.state.nm.us. The site’s creator, Aaron Wiley, designed a dynamic layout that offers a flexible, user-driven reading experience, together with eye-catching photographs. Visitors to the site can select specific areas of interest, such as fishing, hunting, photography and outdoor recreation. People also can look for a variety of categories that span editions that are focused on individual tastes, or perform a specific word search. Past articles of importance are also available, including a nine-part series by John Crenshaw that appeared between the winter 2002-03 issue through the summer 2005 edition about the history of wildlife management in New Mexico. The spring, summer and fall 2016 issues currently occupy the site, but it will continue to grow as each issue is published. Archived PDF versions are available dating back to 2005.